Despite the euphoria surrounding the National League for Democracy as elections approach, signs indicate all will not be smooth, even if the party takes power. MYAUNGMYA, Irrawaddy Division — When Aung San Suu Kyi’s candidate emerges at a campaign rally in the Irrawaddy Delta, the crowd bursts into cheers and showers him with flowers, confident that the opposition will prevail this weekend after decades of struggle against military rulers. The scene in the town of Myaungmya, in the country’s rice-growing southern delta, is being repeated across the country as Burma prepares for an historic election on Sunday that is likely to be dominated by the National League for Democracy (NLD) party of the Nobel laureate. The country has no opinion polls, but other parties are clearly scrambling to match the size and enthusiasm of crowds at NLD rallies. On Sunday, Suu Kyi, 70, received a rapturous welcome from tens of thousands as she closed out a two-month campaign to take power in a country emerging from an isolated half-century of military rule. For NLD supporters, the vote will be an historic chance to right past wrongs. The party won a landslide in 1990, which was annulled by the junta. Suu Kyi was by then already under house arrest, which was to last most of the next 20 years. She was freed in late 2010, a few months before the military handed power to a semi-civilian government led by ex-generals who launched political reforms that led to Burma emerging from decades of international isolation. In Myaungmya, Soe Moe Thu, a baby-faced doctor, is hoping to ride a wave of NLD support into the country’s Lower House of Parliament. At rallies in village fields and dusty roadsides, NLD supporters cloaked in the party’s fighting peacock logo mob him with handshakes and plastic flowers. Despite the euphoria around the NLD as elections approach, there are signs that all will not be smooth, even if the party comes to power. Internal dissent is one problem for the NLD, which is deeply divided despite the popularity of Suu Kyi. If the NLD wins a majority, it will seek the presidency. Suu Kyi herself is barred from the job by the Constitution, but she has said she will be the leader of the government. That could lead to a dysfunctional leadership. And the military, which has a reserved 25 percent of the seats in parliament, is not going away. The current ruling party, the Union Solidarity and Development Party (USDP), is made up of influential former generals and businessmen who made their wealth through ties with the former junta. Radical Buddhist monks, who are gaining influence in Burma, have called on their followers not to vote for Suu Kyi, essentially allying with the USDP. The NLD itself, with little experience in power, may struggle to make the transition from political struggle to governance. Signs of that have appeared in Myaungmya, in the country’s densely-populated delta region. The area’s Lower House seat was one of 43 constituencies the NLD won in 2012 by-elections, which also saw Suu Kyi enter Parliament for the first time. But local party officials say many voters soon soured on the local member, Mann Johnny, who was blamed for failing to direct government spending to the area. The selection of his successor triggered acrimony, a pattern across the country since the NLD’s candidate selection was highly centralized. 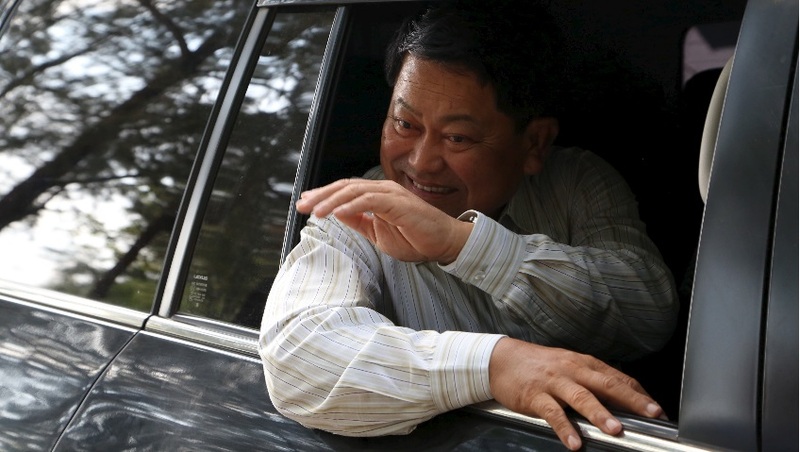 Soe Moe Thu, the Myaungmya candidate, said party divisions would not affect the campaign. The USDP has poured resources into retaking the constituency, running as its candidate Tint Hsan, the sports minister and a construction tycoon whose company built the decade-old Parliament in the capital Naypyidaw. In the past year, the USDP has built 26 local schools and renovated 45. Tint Hsan last year spent his own money on sending 224 high-achieving children from village schools on all-expenses paid trips to Singapore and Thailand. Tint Hsan, the Lower House candidate for the ruling Union Solidarity and Development Party, waves to supporters from a car in Myaungmya Township, Irrawaddy Division, on Oct. 28, 2015. The local chapter of Ma Ba Tha, an organization of nationalist monks that has spearheaded a national campaign against the country’s Muslim minority, looms large over Myaungmya, as it does over the country’s political landscape. The group has exhorted locals to vote for candidates who “protect race and religion”—a reference to four anti-Muslim laws drafted by the group and passed by the USDP-dominated parliament earlier this year. The NLD opposed the laws. Both Ma Ba Tha and the USDP deny working together. Holding the NLD together so far has been deep affection for the woman many supporters call “Mother Suu,” said Bo Phyu, the man overlooked for the Myaungmya seat. Top Photo - ( Reuters ) Soe Moe Thu, the Lower House candidate for the National League for Democracy, receives flowers from supporters at a rally in Myaungmya Township, Irrawaddy Division, on Oct. 27, 2015.